Antistatic bubble packaging is designed specifically to protect ESD-sensitive electronic components from damage caused by static electricity. Anti-Static Bubble material is manufactured to meet Federal Specification PPP-C 795C Class 2; available in SC-120 (3/16 in. ), SD-120(1/2 in.). Bubble grades available in PC-220 (3/16 in. ), and PD-230 (1/2 in.). 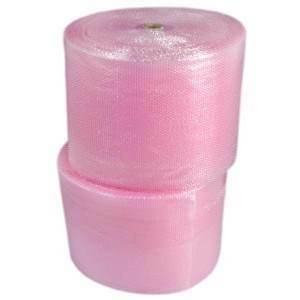 Bubble wrap is sold by the bundle. Each bundle is one roll is 48" wide and can be slit into either four 12", or two 24" sections. 299641 3/16" 48" 750' 12"
352175 3/16" 48" 750' 24"
5358 3/16" 24" 500' 24"
350459 5/16" 48" 375' 12"
350458 5/16" 48" 375' 24"
108452 1/2" 12" 250' 12"
293154 1/2" 48" 250' 24"
326321 5/16" 48" 375' 12"